I’ve been kicking around the idea for a while now…selling cakes! I’m a good cook. I can “burn” if I do say so myself. My repertoire of what I can make is SOLID. I can also learn how to make just about anything. I made a pound cake for the 1st time a few Mother’s Days back and it was GOOD! FIRST time out the gate. I also got a recipe from the Food Network site by Emeril Lagasse, for a sweet potato cake. I removed the nuts, swapped the all-purpose for self-rising flour, used pumpkin spice in place of the cinnamon and nutmeg and added spiced rum and almond extract to the potato mixture. Drizzle it with orange glaze and its a wrap. EVERYONE who tastes this cake falls in love. It’s the kind of cake you have alongside a nice cup of coffee, tea or hot chocolate. I love baking. I love making things from scratch. I love experimenting. *looking for a new guinea pig* I love when something comes out perfect…or at least better than I expected. I am also creative. I’ve made flowers out of card stock…so why not sugar? 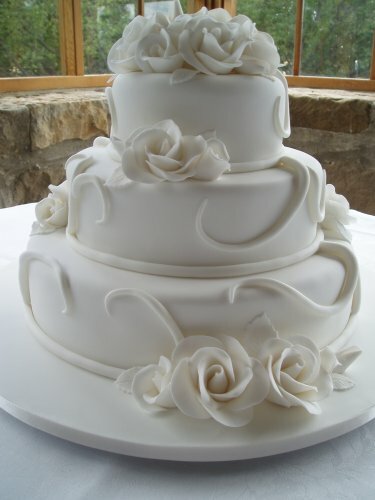 I have an eye for detail…why not apply that to something beautiful like a wedding/birthday/shower cake? As I was sitting here watching “Amazing Wedding Cakes” on the WE channel…I saw the combination of baking and art becoming intriguing. I need a little tutorial and some time to perfect a method. I have a few cake recipes in my artillery…some basics that can get pimped and morph into other things. I mean…a yellow cake is plain until you add lemon peel and extract…then VOILA…Lemon Cake. LOL As long as I’ve got basics…I can elaborate on that.